Armstrong Antlers and Anglers helps Stuff the Bus | Center for Family Services, Inc.
Joshua and Alex Kocan model the book bags purchased through the assistance of Armstrong’s Antler’s and Angler’s. Success is in the Bag for Crawford County Students. The Center for Family Services, Inc. provides new book bags and school supplies to any student in Crawford County from pre-k to 12th grade. Many local families struggle with every day financial issues. Adding the expense of clothing and school supplies for Back to School, may mean less food on the table or a utility left unpaid. The money has to come from somewhere and, like most parents, these families want their children to succeed. 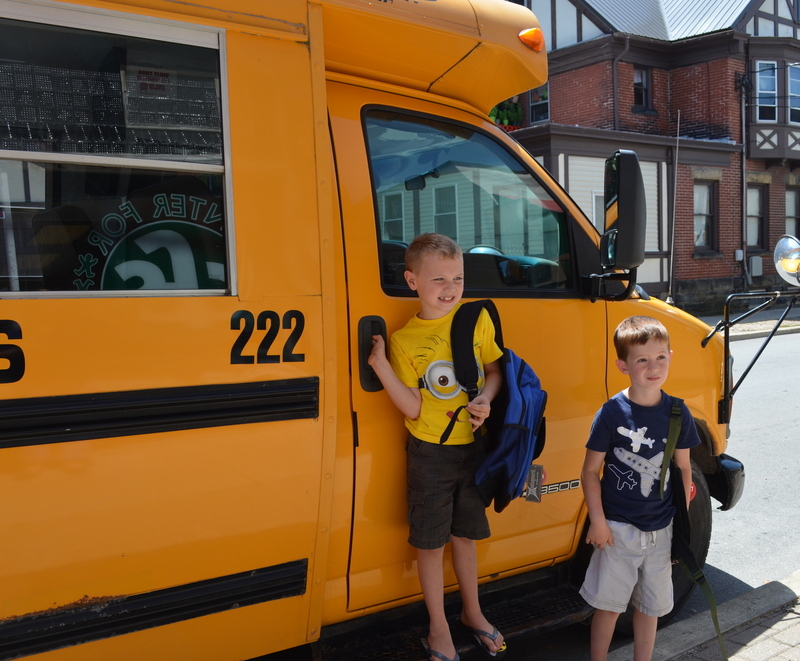 Center for Family Services hosts “Stuff the Bus” events during the summer months in preparation. Volunteers of all ages team up to collect new school supplies and monetary donations at the Meadville Walmart and Walgreens. CFS has a lofty goal of helping 1,200 students in 2015. It is possible with the community’s help. The Success is in the Bag program received a huge boost to kick off the 2015 season with a donation from the Armstrong sponsored Antlers and Anglers event. Armstrong chose Center for Family Services as the recipient of last year’ s proceeds from Antlers and Anglers because it fits into their ongoing Breaking Bread Initiative. From donating food items to the monetary donation, Armstrong thought CFS’s mission was a perfect fit. Armstrong is planning on working with CFS on this year’s Antlers and Anglers event and earmark proceeds once again for the agency. 2015 Antlers and Anglers is scheduled to be held at the Crawford County Fairgrounds on Saturday September 26th and Sunday September 27th. What supplies are most needed? •Donations of new school supplies are accepted at anytime during business hours at Center for Family Services, Inc. The agency is located at 213 W. Center Street, Meadville and is open from 8am to 4:30pm. Monetary donations are also accepted online at http://www.ctrforfamilyservies.org (please note school supplies in the comments if you donate online). • Registration is July 28, 29, 30. Parents and guardians can register by calling 814-337-8450 or via our website. The form will be visible on this site during registration days. • There are no income requirements. The program will serve as many students as possible. • Student must be attending school in Crawford County, public, private or home school. Pre-K through 12th grade. • Supplies will be distributed to registered families on Aug. 8th at the Success is in the Bag Community Fair at Diamond Park. CFS is hosting a Community Fair at Diamond Park on August 8th, 9am to 2pm. The Fair is open to the public and is offering a wide variety of activities for families. • Laural Technical Institute will conduct tours of their facility and the Cosmetology Department will offer $5 Back to School haircuts for children. • Meadville Lions Club will conduct free vision screening. • Home Depot is presenting an onsite Kids Workshop with multiple projects to select from, assemble and personalize. • Kid’s games presented by Girl Scouts of Western Pennsylvania and Families First Head Start. • CrossFit Kids Obstacle Course at CrossFit Meadville & Bill Lawrence’s Personal Fitness. • Variety of Yoga Demonstrations by Brookside Yoga. • Photo session, Back to School grooming and hygiene tips and Medication Counseling from Walgreens. • Book Bag decorating sponsored by United Way of Western Crawford County & Stone Methodist Church. • Back to School Safety by Meadville Police. • Other event participants include , PMI, Creating Landscapes for Families, First Niagara Bank and many more. For more information please call 814-337-8450 or contact us.